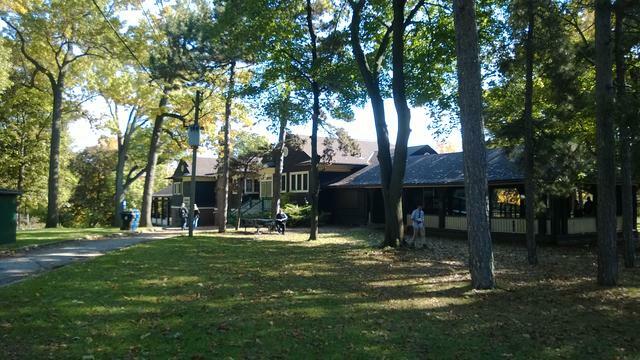 Meet at the east veranda of the High Park Nature Centre (the side that doesn't have the accessibility ramp). Please be sure to arrive ON TIME for this tournament. We will start registration at 6:30PM and will begin the tournament at approximately 7:00PM. If you think you're going to be a little bit late, let me know and we may be able to work something out. Thank you! Tournaments will typically take a few hours to complete: All players in our tournaments have the opportunity to play multiple matches before potentially being eliminated from the tournament. We value the opportunity for players to have meaningful tournament matches and to gain points in our rankings, and like to stay away from the harshness inherent to Single Elimination style events for the first stage of our tournaments. As a result, our tournaments do take a few hours to complete. The total time depends on the number of participants. Depending on how many players we have, we play using either Round Robin, Block Round Robin, Swiss Format, or Double Elimination. In each case, please note that the tournament will take at least two hours to complete after registration has finished and the first tournament matches have begun. The more participants we have, the longer it may take, but this cannot be determined until the day of the event. Thanks for your understanding! Just a quick reminder for everyone that the day following this event on May 25th and on May 26th we will be hosting two exciting events at Anime North here in Toronto! Beyblade North 2018 brings giveaways and high-speed battles for players of all ages and skill levels! Even if you’re new to the game, our expert bladers will give you hands-on training and equipment to battle with. This will be our tenth consecutive year attending Anime North, so it's a huge milestone for us. I hope everyone who makes it out to this event will also be able to be with us for these events! All tournament winners will receive some awesome prizes and we'll even have giveaways on each day for random tournament participants. We will also have a shop filled with not only some of the latest Beyblade Burst releases, but with some hard-to-find Beyblade Legends and Beyblade Shogun Steel releases, courtesy OldSchool™! And we're also working on another cool feature for our booth which hopefully I can announce soon. Anyways, good luck to everyone attending this event! Just a reminder guys this tournament is still on a go! Hope to see everyone again! I'll be there at 6:30. Yami and I are driving over from the airport right now. Will be there around 7! Hey Yami, can you please submit the results, winning combos, and fees for this tournament? Thank you! Hey Yami, it says the file doesn't exist when I click the link. Could you try posting the link again? Thank you! Yami Thanks! I see OldSchool™'s username is not transcribed accurately. Can you please update that and double-check that all other usernames are 100% accurate? A good way to do that is to try pre-processing your event. Errors will become obvious at that stage because you'll see blank spots on the match listing when you try to save the matches after copy/pasting them into the winner/loser fields on this event page. Yami, just wanted to follow up on this event. It looks like we are missing the user "ParkerX" and "Mveats" listed in the spreadsheet should be "mveats". Can you please point us in the direction of the proper account page for "ParkerX" (or let us know if an account needs to be created) and also update the spreadsheet to list "mveats" instead? Thanks! Quick update Yami: ~Mana~ let me know from his notes that apparently we're supposed to create ParkerX with mveats e-mail. So you'll just need to update the spreadsheet with the proper spelling for mveats. Thanks!